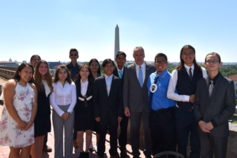 WASHINGTON – Yesterday, U.S. Secretary of the Interior Ryan Zinke and Principal Deputy Secretary for Indian Affairs John Tahsuda met with a group of high school students from across Indian Country. The students are in Washington, D.C., with George Washington University's INSPIRE Pre-College Program which is an abridged version of the school's Native American Political Leadership Program, a semester-long internship program for college and graduate students. The students visited with the Secretary for about half an hour. They candidly asked questions about important issues relating to the Land Buy-Back Program for Tribal Nations, increasing access to higher education, and cutting red tape. 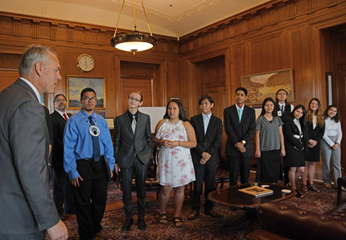 One young man shared that he had family at the Fort Peck Reservation where Secretary Zinke is an adopted member, and that he had heard stories of Secretary Zinke from back home. Principal Deputy Assistant Secretary for Indian Affairs John Tahsuda met in a separate meeting with the INSPIRE students. He enjoyed their insightful questions and the open discussion. The students in the program identified themselves as members of the following Tribes: Menominee Indian Tribe, The Navajo Nation, Confederated Tribes of Siletz Indians, Choctaw Nation of Oklahoma, Mississippi Band of Choctaw Indians, Hopi Tribe, Nez Perce Tribe, Eastern Band of Cherokee, Seminole Nation, and Athabascan.